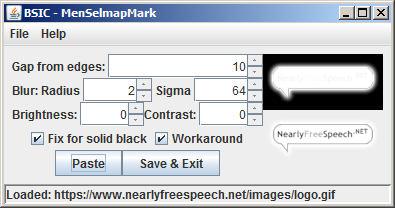 The Brawl Stage Image Generator can take in an input image and convert it to a Brawl MenSelmapMark image using ImageMagick. To use this program, ImageMagick's convert.exe must be located in the system PATH. You can do this by installing the Windows binaries from imagemagick.org (either Q8 or Q16 versions will work) or by installing it through Cygwin. The preview panel will show two images. The top image has a black background; this is what will be saved for use in MiscData. The bottom image is what it will look like in-game. You can use the command-line argument -auto to process multiple files and save them to new files in the same directory.